United States Antarctic Program Web Portal — Visit the USAP portal for information on U.S. program activities. 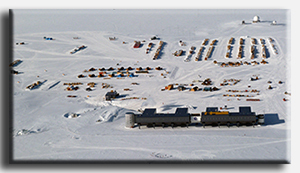 The U.S. Antarctic Program, Antarctic Infrastructure and Logistics Section, operates three year-round stations—McMurdo, Amundsen-Scott South Pole, and Palmer stations. Camps operate only in summer to support field research. Automated geophysical observatories and more than 100 automated weather stations operate year-round. The weather stations involve international collaboration with the Italian, German, Australian, and British programs. Visit the Palmer Station webcam. Read recent reports from Palmer Station, published in the Antarctic Sun. Ski-equipped Hercules airplanes (LC-130) transport fuel, equipment, supplies, and personnel from McMurdo Station to inland sites, including Amundsen-Scott South Pole Station, and from New Zealand. During the austral summer, wheeled military transports (C-17s and C-130s) also bring equipment, personnel, and supplies to Antarctica from New Zealand. Ski-equipped Twin Otters and Basler aircraft also provide support to field teams during the austral summer. The U.S. Antarctic Program operates two icebreaking research ships, Laurence M. Gould and Nathaniel B. Palmer between South America and the Antarctic Peninsula, in the Antarctic Peninsula region, and in the Ross Sea near McMurdo Station. Icebreakers annually open a channel to McMurdo Station to enable a supply ship and a tanker to reach the station. 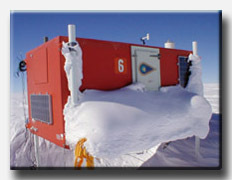 Automated Geophysical Observatories supported by the U.S. Antarctic Program.